The Zebra line of ribbons has set the industry standard of ribbon performance. 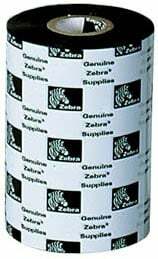 These ribbons have been used in the development of all Zebra printers. From the printhead burn tables to the spindle tension settings these ribbons have set the standards of Zebra printer development. When you chose Zebra ribbons you can be confident that you are choosing ribbons that are demanded by many companies around the world. The Zebra 06100GS06407-R is also known as 06100GS06407-R	or 06100GS06407R	.